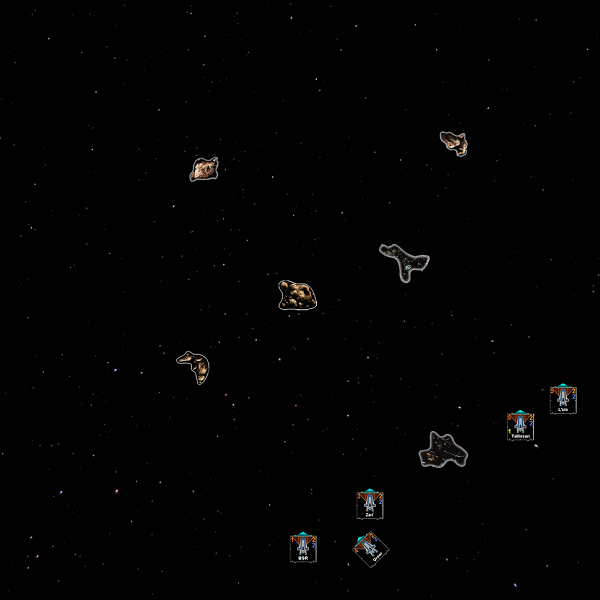 I'm planning on getting those non-formation vassal images together tonight. There definitely isn't a wrong answer for AO on Lulo or not. Mark Moriarity﻿ beat the crap out of me in a 5 RZ2 mirror and had almost the same list except Lulo had AO, no crack on Zari and only Heroic on the Blue. I don't think there's a wrong answer either way, just make sure to have at least 4 AOs, 3-4 Cracks and at least 4 Heroics. Do you have any thoughts on the 4x blue/green + t70 variants? Do you think they're strictly behind the named 5A/crack lists? I have zero experience or exposure to the 4x generic As + T70. Alright, time to deliver on what's been promised. There will be 2 essential samples, both starting with the same setup that will go to the first engagement. One will be more aggressive trying to surround something like a rebel beef squad in the opposite corner. The other will be a bit more passive, but pounce on a potential target at the same turn number. Also, ignore the weird white box thing that show up in a few of these as I'm not sure how I got that to show up and how to get rid of it. @GreenDragoon @gennataos @prauxim @Deroche I know a few of you wanted to see this and share this with others. 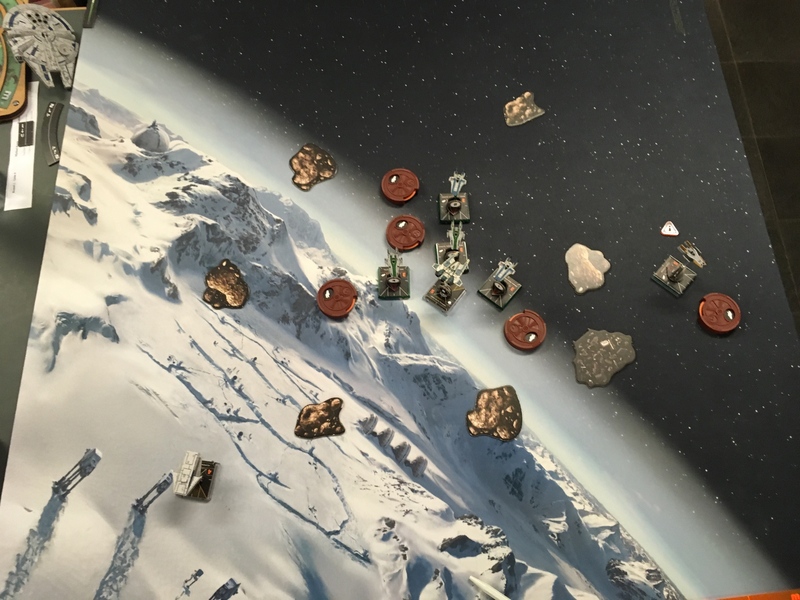 Turn 1: Start a bit of a fan out, generally keeping the low initiatives in the middle of the board and Talli with Lulo ready to go up the board to flank. Turn 2 (Aggressive): Blue still keeping distance, but open field to shoot up the board. Greer and Zari both ready to make moves in the middle. Talli and Lulo both 5 straight, but only Lulo boosts to make his way around that pivot rock. Turn 3 (Aggressive): Blue still keeping a bit of distance. Greer and Zari may have shots this turn, but don't commit too much to allow Talli and Lulo to make their way over for the killbox. Turn 4 (Aggressive): Blue goes fast with 3 bank and boost, Zari 3 bank, Greer 2 bank, Talli 2 straight to keep distance to allow escape routes next turn and Lulo with 5 straight and boost. Solid Bullseye crossing for crack shots. Turn 2 (Passive): Blue stays low with 1 turn/barrel rolls. Zari to bank, Greer 1 turn away, Talli just 2 straight, Lulo 2 straight and boost. Even with the turn away moves, hard turns to the left for Zari and Greer still put them in an engaging position. Turn 3 (Passive): Blue, Zari and Greer stick to 1 hard turns opening up their ability to pounce while staying back farther. Talli 2 bank and Lulo 3 bank plus straight boost. Turn 4 (Passive): Blue 2 bank plus opposite bank boost, Zari 3 straight plus bank boost, Greer 3 straight, Talli 2 bank boost and Lulo 3 bank plus bank boost. Not as many bullseyes crossing together, but still a solid chance for one to catch their target. The big take away from examples above is the how wide you can fan out your Awings and converge in a nice overlapping arc location on the board. 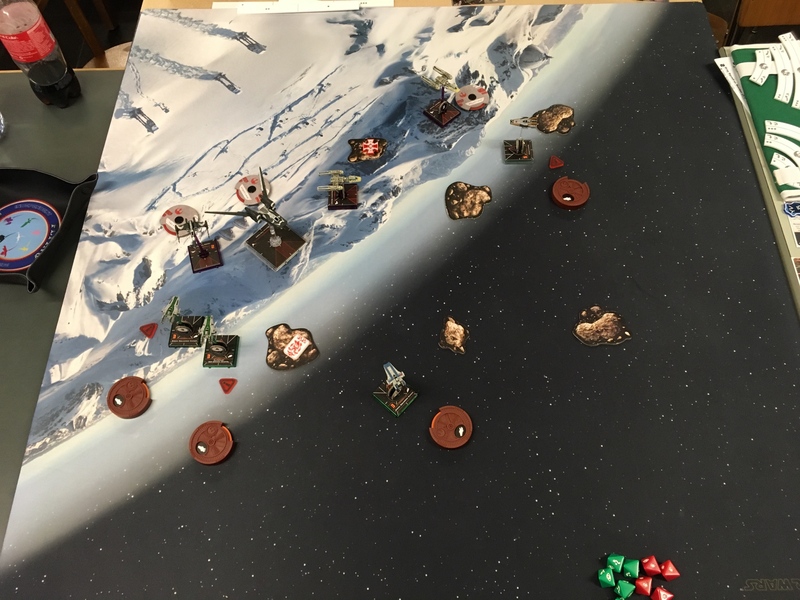 Deciding early on whether you can be the aggressor because it's easier to forecast where your target is going to be or if you have to be a bit passive early to give your ships less committing options and keep your opponent guessing. It's very rare I see an opponent setup in a joust on the same side of the board as me so Talli and Lulo have had the ability to get up the side of the board quick. You generally want to pick the side of the board to start setup that gives you a middle and a top corner pivot rock. That way you can turn in Talli and maybe Lulo if he's needed earlier at the middle rock or keep Lulo going around the top pivot rock. Hope this helps a bit. This is by no means the only way to surround and create a killbox, just one example that has worked quite well for me so far. The general pattern is, stretch the As out as far as they can go from each other (while staying safe) and just when it's at it's max, snap them all back together to surround your opponent. Think of it like a tension wire getting stretched out before snapping back in on itself. It overall makes it really hard for your opponent to commit to a certain area because it might be only 1 AWing they can shoot while the other 4 surround them from less desirable angles to be able to also engage with. This is absolutely great stuff. Thanks! Take my input with a "haven't actually played 5A, mostly playing XXAA" grain of salt, but I think you guys should spread out even more. 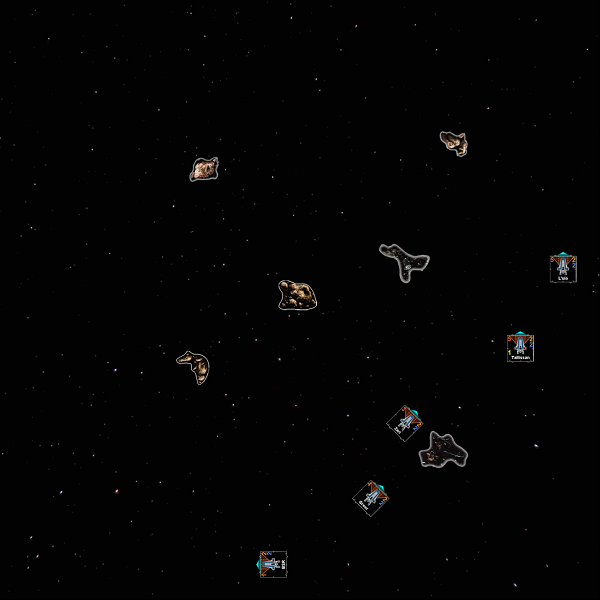 These ships have the best dial in the game and can shift/converge in a single turn. I think you guys are working harder to build those nets than you have to, and can make those nets start wider. Morgan's games against Tyler and Paul are more what I'm thinking. I've just picked up my 5th A-wing and look forward to fielding them. I wanted to ask if you thing 5As (like Rstans list) is preferably used in HS tournaments or are they viable as top tier in say a System Open? Definitely viable in Hyperspace format to the point it's probably one of the best Resistance hyperspace lists. I haven't tried in Extended, but my assumption is there are too many things that shred lower initiative focus tokens off between Juke Phantoms, Palob, etc. On top of that Sloane weaponizing your stress against you for the ships ability also really hurts. Extended at least makes it a more uphill battle, just don't know how steep the incline of that hill is. We have a player who picked up his 5 RZ-A2's and fielded them twice. He reports that they're a lot of fun to fly, but his win ratio is 0 & 2. . Sounds a bit like my 8 TIE/ln team. May be a lot of fun to fly but I'm not expecting to win all that often. 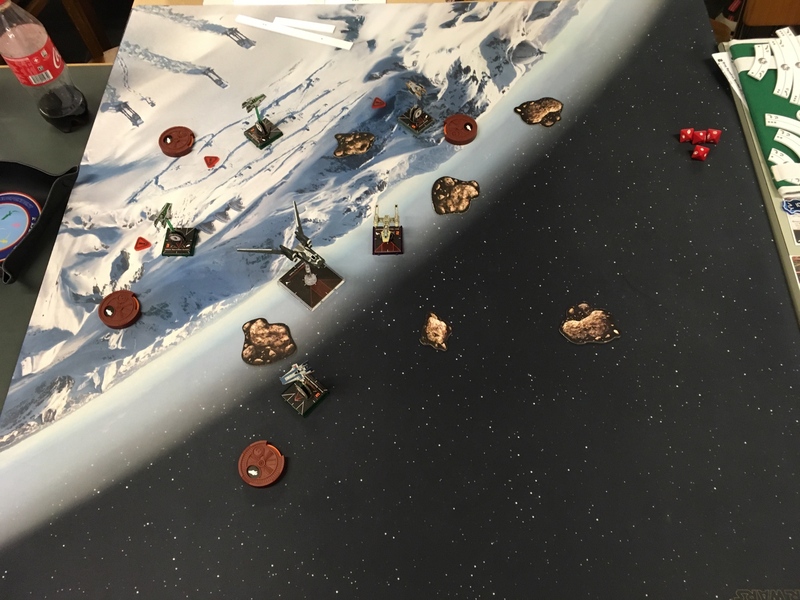 I got my first game with the As today against the Dirty Y-wings list. I brought it home 125-106, but is was down to the wire. I started up like RStan exemplified, but I got too aggressive too soon and did a couple of bad calls manouverwise. He messed up with selfbumping on a crucial turn which helped me. It's a winnable match-up, but range control and patience is key here. Dice variance is too scary on range 2. The list was fun though, so I'll definitely keep running it. 5 As just won the regional in Austin. Alright, time to deliver on what's been promised. And you did! This is awesome! I'm starting to warm up to the idea of both 3-4 named pilots, and to playing them more individually. For example yesterday I had a game against a TIE swarm of 6. 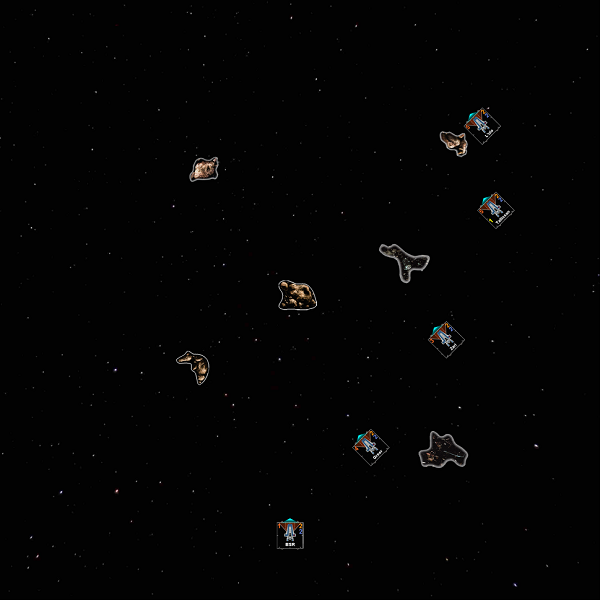 I think my gameplan was allright, but I realized that I would have liked to have one generic more separated. And that happened more and more often over the last games. I still think the finger four has advantages for some situations, but I should and do split them earlier and earlier. We have a player who picked up his 5 RZ-A2's and fielded them twice. He reports that they're a lot of fun to fly, but his win ratio is 0 & 2. 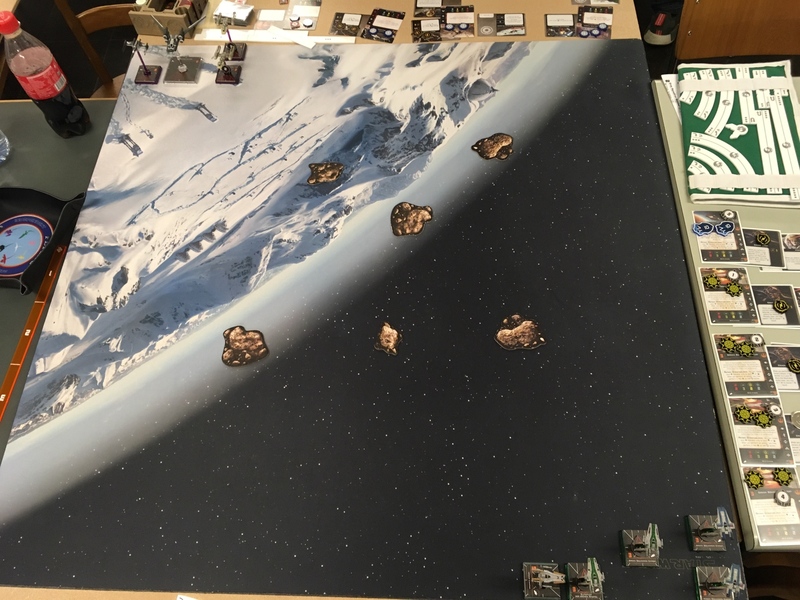 I got my first game with the As today against the Dirty Y-wings list. I brought it home 125-106, but is was down to the wire. I started up like RStan exemplified, but I got too aggressive too soon and did a couple of bad calls manouverwise. I still think it's a very fun list that requires some practice and some adjusted intuition. That wasn't you by any chance? Anyway, thanks for the headsup! MOFF! MOFF! MOFF! MOFF! MOFF! MOFF! MOFF! MOFF! MOFF! MOFF! MOFF! MOFF! MOFF! MOFF! MOFF! I'm think he's also the reigning Loopin' Chewie National (World?) champion, which is far more prestigious...? different asian, I only wish I could be that gud. Wasn't that also a different Jesse? To be clear, my assumption was made on my recollection of the name, not ethnicity, lol. Jason I believe? It definitely wasn't me. Ah. Well, all you "J" names look alike. Just like all 40-something guys with glasses, goatee and a hat. Right, @Brunas? Sorry for ruining your A-Wing party, @GreenDragoon. don't worry, it's nice to see it going while I'm occupied with the trials data. Just on the way back from my second (offline) hyperspace tournament. Lost the game on the final table due to many individual mistakes. Most importantly because I forgot to crackshot twice, and I thought I have half points, but the one damage card belonged to another ship. Used the 4+1 v2.5. version with crackshots on all. Great games all day, and ended as best mov 3-1 on second place. Battle reports will hopefully come soon tm. 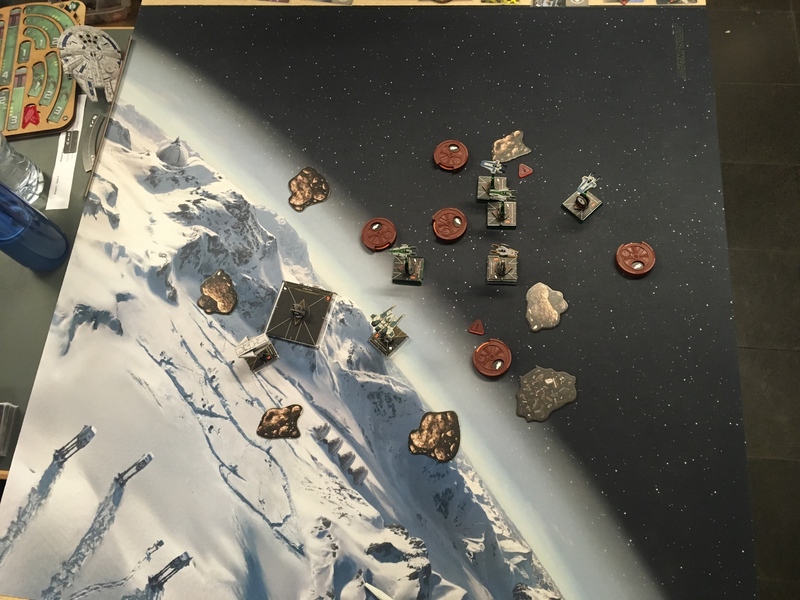 Small hyperpspace tournament from last weeken. 15 players, Wave3 not yet legal (as announced way in advance). A good (hungover) player who hasn't played in a while and thought there's a price for the best fluff list... very fun game as we always enjoy playing each other. Usually the games are extremely tight as we are very likely on an extremely similar level. But the list and recent practice made the difference this time. Opponent's﻿ determining action and my target priority: His Benthic is the key piece. Edrio and the Gray are dangerous due to the torpedoes. Dutch is largely irrelevant, only his extra lock is good. Deployment: I set up my first two rocks as usual, giving me a screen for table flips, a way to thread through, and occupying the center. He placed the three in the south field, so my third went to the NW field. His ships started in the NW corner, but my rocks were already placed to go into the SE corner anyway, so that fit me perfectly. T﻿he﻿ gameplan for the first tu﻿rn﻿s: Full flight, flank with Lulo. I want to surprised him with going fast and past him in the west gutter/west field. That gives me the NW part of the map to run away while he has to go through the rocks to turn. 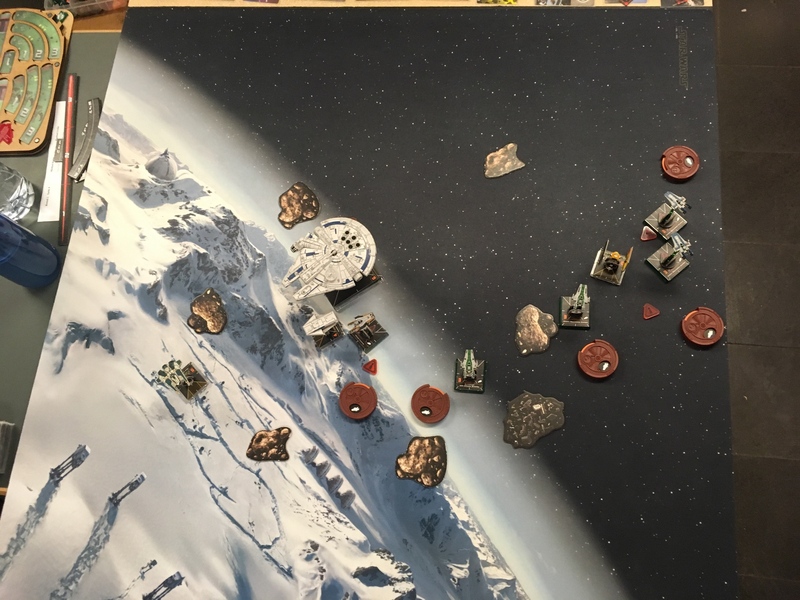 Turn 1-2: I did the full flight, he moved into the gap in the rocks as expected. Dutch came around north but we didn't exchange shots for half a centimeter. You see in the image that I did something new: team 12 did 1hards and I split up the team a bit before, with escape routes towards east. Turn 3: His gray surprised me a bit by banking in and covering for Dutch so he couldn't be arc dodged well, and Dutch threw him a target lock. Edrio tried to proton team 34 but couldn't get the lock. No clue what his U was doing. My team 34 went directly against Edrio. Nr 2 went a bit forward to get bullseye on the U (but later shot the Gray anyway, for focus fire), and Nr1 did a 3bank+1bank boost around the rock. That brought him too close to Dutch and I paid for that mistake! Edrio went almost down, Dutch took a beating, and the Gray lost shields. Mistake: I didn't follow my target priority, and lost a ship. But I also did a lot of damage, so in the end the trade was worth it. I lost too much on ship nr4, who went down to 1 hull. That was unnecessary. Turn 4: His U came slow, the Gray turned in. Dutch tried to jump Lulo but bumped. My Nr4 bailed out with 5 straight and boost, nr 3 and 2 made sure that Edrio goes down. Lulo jumped past Dutch and turned arc for a 4vs1 shot (and took him out!). 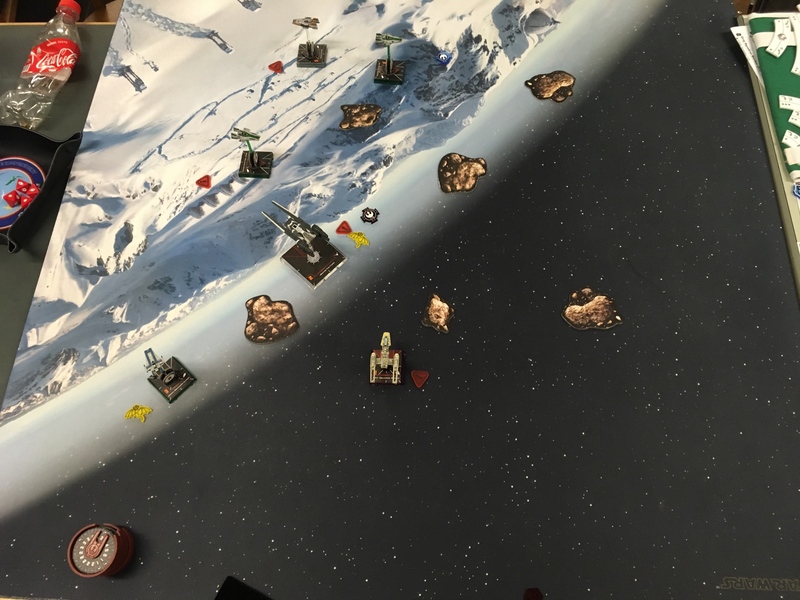 Good round for me overall, suddenly he was down two ships. My nr2 lost two shields iirc. 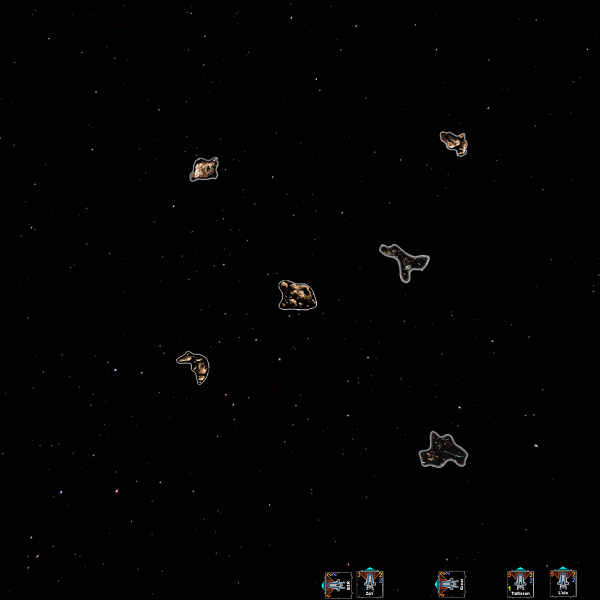 Turn 5+6+7: Both his ships turned around, my ships circled and I took him out. Much done right this time. Turn 3: first shots. You'll notice my nr1 is missing after a brutal torpedo. 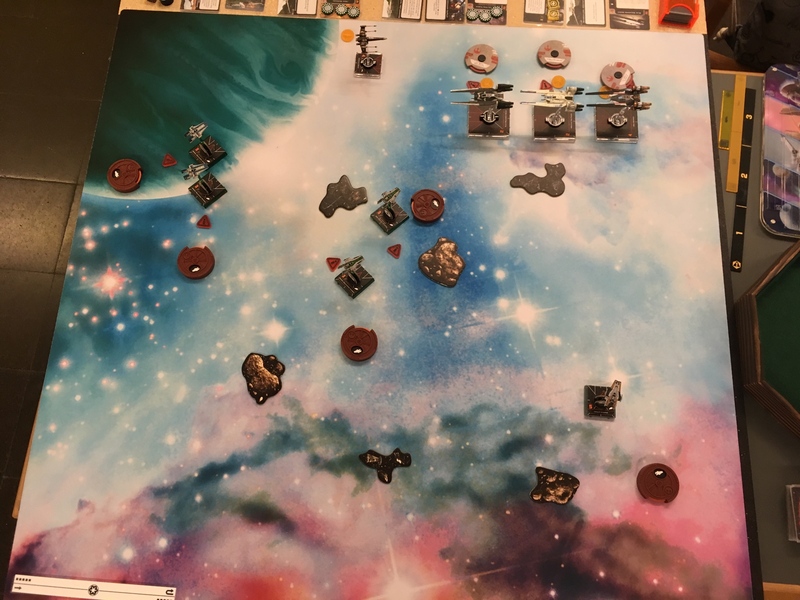 23.3.19 Hyperspace Tournament Game 2: rematch, it was my game 3 on the last tournament against the same guy and list, and the only one I won despite being sick and extremely tired. He did adjust the list a bit though, and had the most hilarious turn 0/1! Such a fast game. 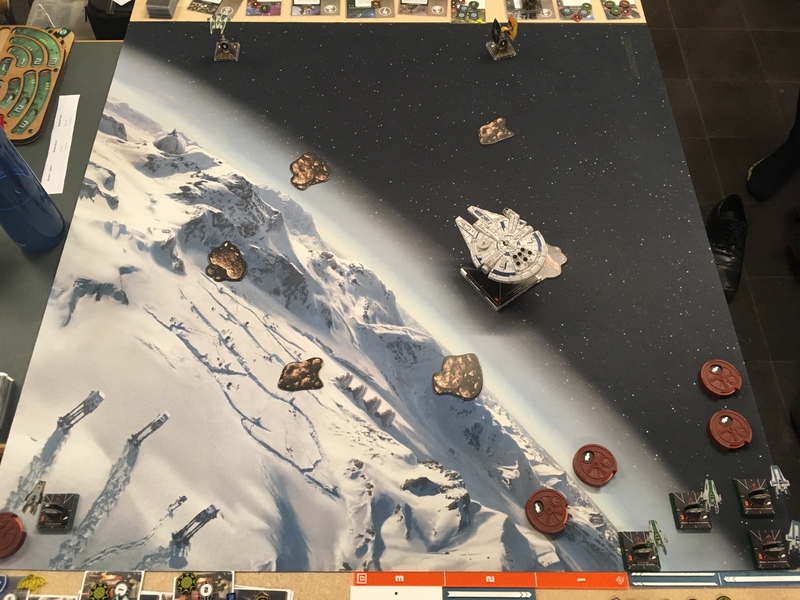 Opponent's﻿ determining action and my target priority: ALL THE GUNS ON HAN! Block Teroch and use remaining crackshots. Seevor and Lando... take them when they are offered, but don't focus on them. Deployment: Uh... So, I don't remember who put which rocks. But anyway he replaced one with Tobias. His Escapecraft started docked, and Han set aside. Seevor was on the NE end at a weird angle facing out, probably to bank around the rock. I deployed the finger five in the SE corner, and Lulo in the SW corner. Teroch setup in the NW corner. 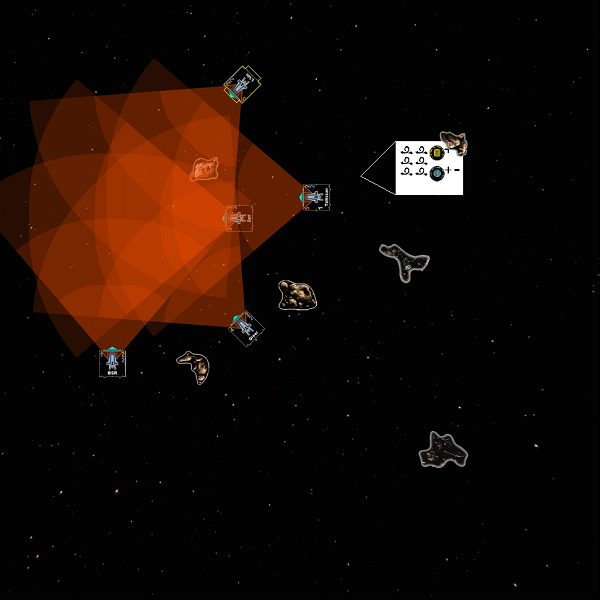 Now, Han deployed right in front of my swarm facing inside the field. 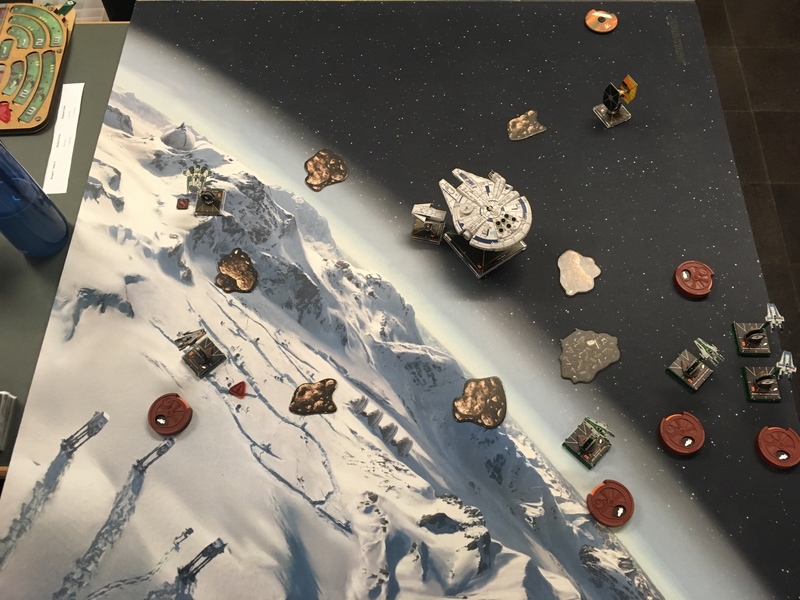 T﻿he﻿ gameplan for the first tu﻿rn﻿s: Go after Han. I mean.. what? Turn 1: System phase. Shuttle docks off. Coordinates an action to Han. Han drops rigged cargo chute. Rrriighhhtt... Whoops! Unfortunately for him he wanted to afterburner, but didn't move fast enough. That caused Han to bump after being made aware, and then he didn't get mods. But it was a hilarious first turn for sure! My team 12 went straight, 34 banked after Han. Nr4 was able to get out of the way, but nr3 had to roll (no boost though, I learnt that lesson!) to prepare next turn. Ofc nr3 was shot. Oh, and Teroch shot unstressed Lulo (nothing happened), and Lulo shot Lando (nothing happened). Turn 2: Here was my thinking: He can't possibly go 3bank with Seevor because I'll block that and take him apart with my own 3 banks. Much smarter would be to bank and roll out of my arcs. So I tried to cover more by staying closer to the edge and going straight+boost. He didn't care and went 3bank anyway. The middle saw some very important action: His Lando blocked his own boost by a tiny bit, and the final position of Han meant he couldn't shoot the stressed Lulo, but Lulo could shoot Han. That was huge! I almost took out Seevor and started to hurt Han quite a bit. Turn 3: I expected Han to turn NW through these rocks. His position was perfect for that. Fenn was obviously coming close from behind, and Lando... who cares. So I set Lulo to hunt down and finish Seevor, and the others to close in on Han. I was a bit proud on my super tight maneuvering for the three generics. What I did not expect was that Han just bumped into Lando. That meant I took heavy shots from Teroch, and nearly destroyed Han. Turn 4: He did again a strange move with Han (2 hard) and placed him neatly in front of all my generics, who also blocked Teroch in the process. Han was gone, Teroch wounded. Turn 5: Teroch did a T-roll and died to the rear arcs. Teroch used his ability just once (and forgot it a second time I think? ), which is good. This guy is pretty good. Like, "currently national top3"-pretty good. Wherever his actual placement, he is pretty good. 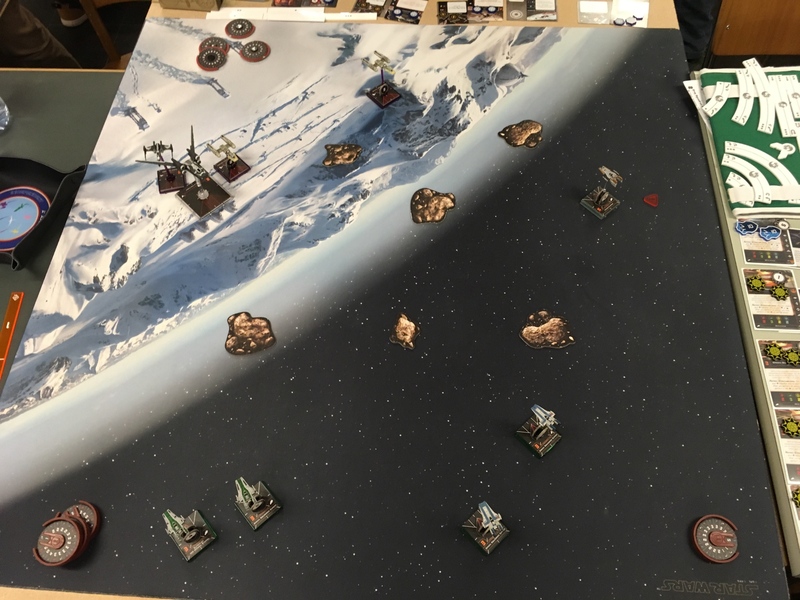 Opponent's﻿ determining action and my target priority: Leia really makes the three Uwings work, so she's the first target. Benthic with Perceptive Copilot gives great action economy, so another target right there. I don't care too much about Saw. Garven is just an easier Benthic, so of similar priority. Deployment: I don't remember the order of obstacles. I set down the L-debris and the middle rock, he placed the south field debris. He showed me the Partisan in the NE corner, so I set up the finger four in the SW corner and Lulo in the SE corner. His innermost U is the Partisan with Leia, then Benthic, then Saw. Perfect! T﻿he﻿ gameplan for the first tu﻿rn﻿s: Go fast with 1-4, 1hard for Lulo. Turn 1: He stopped, I did my thing plus boost for generics, plus roll for Lulo. Turn 2: See image. Again fast, and Lulo trying to catch up. I got some first free shots. In the end I'd say my front team was a bit out of synch, but I kind of had to due to 3bank1bank. 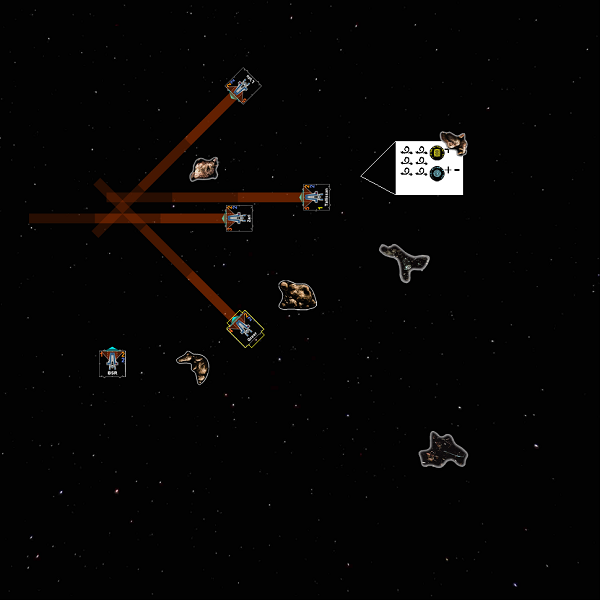 Turn 3: All generics lined up crakshots on the Partisan, except for nr4 in the front who did the 2 hard and turned arc. 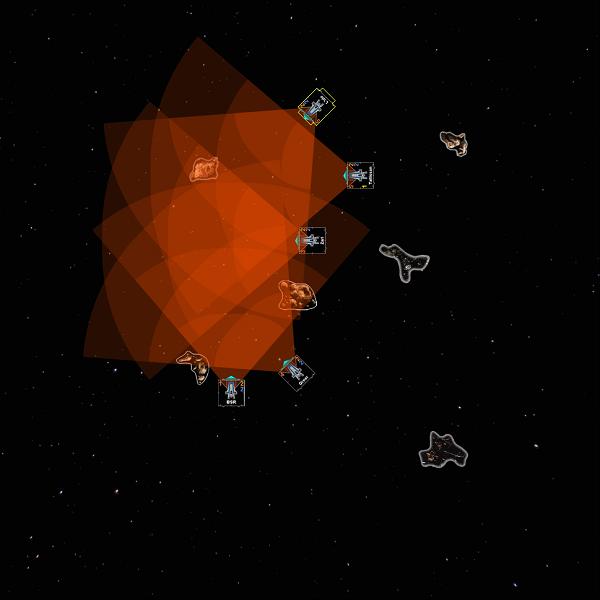 The Partisan got obliterated, and some first damage into Garven or Benthic (I don't remember). Rest of the game: Nr 4 circled around the L. The others blocked Garven and took close range shots. His Us 1banked to the middle. It was a slaughter, and I made a mistake or two. One turn I couldn't decide between the maneuvers but completely forgot about him moving first. Garven went down, then Benthic. In the end it was Saw against several As and I wanted to get some more MOV. 200-100 (1 full, 3 half iirc). I could and should have disengaged with little time on the clock. 4-5 Awings can really take out a U quickly when crackshots are lined up! Turn 2, the only image: My speed took him by surprise!